* The information displayed here applies to approved SIA contractors that operate private investigations and security work within the jurisdiction of the United Kingdom and in some parts of the European union. Hiring a private investigator can be a daunting task. For most it will be a totally novel experience, and one for which there is no comparison. Researching the subject can be confusing and time consuming, and so here at enigma we have put together an easy to read guide to assist you in this process. It is important to note that any Information you receive about hiring a private investigator should be obtained from credible sources within the UK, as the law governing the activities of private investigators and the security industry differs greatly in other countries. Private investigators are regularly being employed on behalf of public authorities and local councils for cases involving fraud and misconduct. Councils have recently come under scrutiny for paying out on private investigators, however this is clearly evidence of the effectiveness of this service when dealing with lengthy cases involving fraud and misconduct. From a cheating spouse to gain grounds for a divorce, to a person seeking evidence of vandalism or trespassing on their land, private investigators are able to slip by unnoticed as anonymous members of the public, and can setup hidden CCTV to gather evidence. A company may seek evidence of misconduct so they can legally terminate the employment of a staff member they suspect of theft or fraud. An investigator can act as a member of the public and setup test purchases and traceable stock items. Cases conducted on behalf of government bodies pursuing fraudulent tax or sickness claims almost always result in legal proceedings. These types of investigations can take up many man hours and as a result, private investigators are often called in to boost the manpower needed to achieve a result. Figures are available online, via freedom of information requests made by members of the public regarding the total amount spend by local authorities on private investigators. Choose an SIA (Security Industry Authority) registered company. The SIA is a UK government organisation that regulates the private security industry and provides licensing to those who are able meet the criteria of the professional standards which they set. SIA licensing is not yet mandatory, however for those undertaking private investigation work, it provides proof that they meet what the UK government deems to be acceptable standards of practice. SIA licensing requires the participants to pass a CRI (Criminal Record Indicator) check, along with a number of other core competency tests. Although amendments to the law were meant to take effect in late 2015, currently there are still no signs of enforcement of the legislation over private investigators. Many companies have already come into alignment with the impending changes, becoming early adopters of the standards and licensing requirements set out by the SIA. In light of this, it would be best to choose from those listed in the approved contractors scheme. Do they provide the service you need? Enquire about what services they can provide and check what information they have listed on their website. Some PI company’s specialise in one area and are unable to provide the full spectrum of services that other SIA fully registered contractors can. Surveillance involves following someone, such as a spouse or an employee and carefully recording their movement and interaction, using video and photographic means. This recorded evidence can then be used in the course of disciplinary hearings or even in legal proceedings. Surveillance can also involve monitoring a particular location and keeping track of who comes and goes. Far from a victimless crime, small business’s can suffer greatly at the hands of fraud and sadly this is often due to staff misconduct. Skilled investigators are able to setup traceable items and test purchasing operations so as to find out where items are going missing. Investigators can use undercover operatives posing as staff or customers, along with hidden CCTV cameras. It is estimated that each year over 250,000 people go missing in the UK alone. Using a number of tested techniques as well as custom software and database analysis, Investigators have a good chance of locating a missing person quickly. Background checks are conducted for companies who require thorough verification of information provided to them from prospective employees. Drawing from resources such as university public records and by contacting formal associations, a private investigator can check military status, criminal record, educational qualifications, address history and marital status. Contact them first by telephone. Some company’s offer a confidential call line where you can ring in to discuss your issue before even arranging a meeting. This can also used anonymously by members of staff or individuals who want to provide information about misconduct or other activities at their place of work. Check if they have an office postcode. A physical office location proves they are a registered business and accountable. Many private investigators operate from just a website and telephone number, without SIA licensing and have no accreditation. Ask about relevant previous experience. When considering hiring a private investigator, ask for an initial meeting in person with the investigator, preferably at their main office and do enquire about their credentials and previous investigations. A previous career in law enforcement and exposure to the judicial system provides the private investigator the necessary skills to build a solid case for an investigation. Ex military personal are also akin to being highly skilled in the areas of undercover operations. Technical equipment is essential to any investigation in this digital age. Quick access to information, as well as it reducing time and manpower, items such as GPS trackers, telephoto lenses and audio recorders, constitute part of the kit of a well equipped private investigator. An ever increasing number of people document their lives daily, and leave a traceable digital signature of their actions and whereabouts. Social media interactions with friends and family can help build a picture of a person being investigated, often showing, where they are and at what time, including up to date photographs. Computer forensics and the ability to extract information from the internet as well as public access computer databases is essential in the collation of evidence for any investigation. A small business, amateur or starting private investigator might not have the budget, skill, expertise or funds to be able to access and utilise this equipment. The cost of hiring a private investigator varies and will normally be billed by the hour. You should arrange an agreed limit of how much you want to spend and what the limit of your budget is. All the relevant fees and administration costs should be made clear and agreed upon up front, there should be no hidden cost to the customer unless a prior agreement has been made. Do you feel comfortable with the investigator? A professional relationship with the investigator is essential, and making sure you have a good rapport with them ensures effective and open communication during the process. Do you wish to pursue legal action? Investigations bring with it a chance of a crime being discovered, and a legal case entering the court system could be a result. Consider if the outcome is something you are interested in pursuing once the investigation has concluded. Most business now have an online presence and the internet provides unfiltered feedback of a customers experience. If a company has been established for any length of time and have no trace of negative feedback, this should be considered a good sign. What is their track record for similar cases? Ask the PI for references or testimonials in regards to similar investigations. Having a portfolio of similar companies, shows they are trustworthy and are able to deal with high profile clients in a professional manner. In a professional arena, business are advised to have professional indemnity insurance should any mistakes or disagreements occur. This covers the costs and compensation of any claims made by persons who feel the need to take legal action. In order to be brought up to speed with an investigation and to reduce the cost and time needed to get a result, a private investigator will ask you for any relevant information you may have about the case. It may be a good idea to have this ready ahead of time. For example, In cases such as locating a missing person, the last known address is a great starting point as well as any know aliases. A good private investigator will understand that communication is essential in keeping a client updated with the on goings of an investigation. Having specified times of communication via email or telephone should be requested during the contract agreement phase. A private investigator is not a law enforcement officer, and therefore they are limited in their powers and activities. The information they are able to access will also be limited to publicly accessible databases. As a private investigator, unless working with a government body and under authorisation, they will have no access to telephone or financial records or the ability to install wiretaps or access email accounts or any other online accounts. If a private investigator offers you any of these services it should serve as a warning that they take risks and could put any case you want to build in jeopardy. Hiring a detective from the approved SIA contractors list will remove this concern. 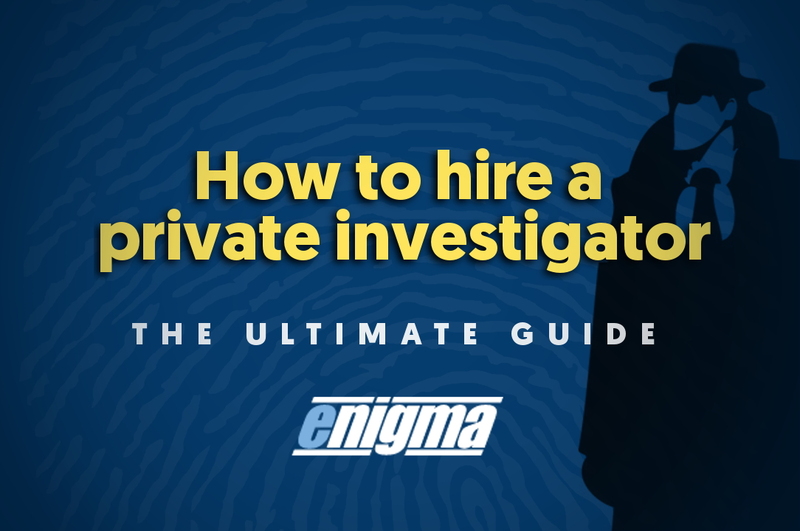 Hiring a private investigator should not be difficult and we hope that this guide has empowered you, giving you the knowledge to make the right choice. Ensure you are hiring professionals by choosing an SIA approved contractor. Enquire what services they provide and what is their specialty. Arrange a meeting in person at their registered office and see if you are able to strike up a rapport with the investigator. Politely ask them for some background experience and relevant qualifications, and ask if they have a list of previous clients for whom they have successfully provided a similar service. Check for recommendations or negative reviews online. Understand their pricing scheme fully and as what the total cost will be. Check they have an insurance policy. Here at enigma europe, we hope that you get the results that you need and that our guide has helped you in this process.